A few words about this web site…. Thank you for looking at our site – please come back again soon. In addition to this website, the Communications Group also compile a regular Newsletter, which is available from a number of local outlets including Heptonstall Post Office and May’s Shop. Click on the following links to see the copies of the Newsletters from November 2013 August 2013 May 2013 November 2012 August 2012 April 2012 . Find out more about the website team here. 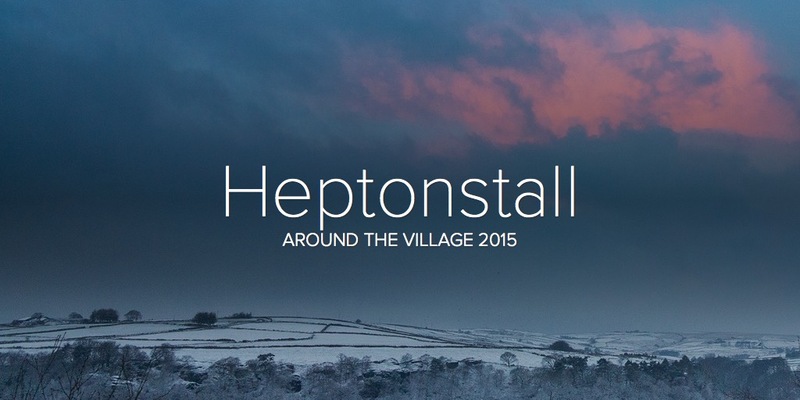 This a wonderful picture(s) of Heptonstall. It makes one wish one had been born there. I have always enjoyed the poetry of Sylvia Plath and Ted Hughes. Love to visit again. What a great job you have all done. Small but beautifully formed…..that’s Heptonstall. The afternoon at this year’s Heptonstall festival on Saturday 21 September will be a galaxy of a dozen or more bands performing on two stages, together with a local bawdy drama, magic, storytelling, dancing and much, much more. The first stage will be in Weavers Square, as it has been in previous years. But the second stage will be in the old church ruins of St Thomas a Beckett. The ruins provide a highly atmospheric backdrop for drama and music. In previous years, a Handel opera was performed there as part of Hebden Bridge Arts Festival and Sheffield University frequently performed Shakespeare plays. But this is the first such use in the 21st century. The festival committee is most grateful for the support of the vicar and churchwarden. Music commences at 11.45 in the old church ruins, during the Mad Hatters Tea Party, with Tim O’Connor and Des Horsfall. O’Connor is a charismatic performer creating a warm and dynamic atmosphere for the day. With Irish roots, he grew up musically in the melting pot of Manchester. His father played ukulele à la George Formby. His influences include the Beatles, Dylan and Neil Young but he has found his own style. Prior to Heptonstall he has played in festivals like Celtic Connections in Scotland, Roche sur Foron in France, Zamek in Poland, Oslo Irish and Boston Johnny D’s Club. On the square, music starts at 12 noon with singer/songwriter Paul Weatherhead. The exciting and eclectic programme throughout the day includes some nationally famous, some up and coming locals and young bands from the Royal Northern College and Leeds College of Music. The main headline act, playing in the old church ruins at 5.55, is Nizlopi – John Parker (double base and human beatbox) and Luke Concannon (vocals, guitar and bodhrán), whose most successful JCB song reached number one in the UK on its second release. The band is named after an Hungarian girl whom Luke fancied at school. Described by Radio 1 as “Political, intense, angular and beautiful”, they play joyful stories, from heart cracked open love songs to their people power invocation ‘England Uprise!’. The other headline act, playing at 5.05, is Taylor Jackson, Manchester born and bred soulstress, whose debut EP ‘Roots’ is available right now! For over 10 years she has been writing, producing, recording and performing music with fellow artists and musicians. Her first solo project draws from her own experience, her love of soul music, and her degree in classical composition to produce something truly inspirational. 18 year-old James Christie from Hertfordshire suffered a serious head injury when 12, which led him to discovering a passion and talent for music when no longer able to play sport. At 16, he wrote his first song ‘You Could Never Know Me’. His backing band includes highly talented Andrew Baukham, Ollie Harding, Alasdair Simpson and Charles Macdonald. James Paul on the other hand is an experienced, enthusiastic guitarist from Edinburgh and RNCM, looking to develop new ways of playing guitar and inducing new sounds to enhance everyday music, from jazz and hip hop to rock and funk, being as diverse as possible in a session. Prior to Heptonstall, he has played at Edinburgh’s Usher Hall, Queen’s Hall and Traverse Theatre. Other performers include bluegrass group from the hills of West Yorkshire, Cowbaby, playing Americana and acoustic, Jenni Doyle, Adonis, Bath-based singer/songwriter Ash Tucker, local singer Penny Stansfield, close harmony singers from RNCM Three of Hearts and Heptonstall’s very own Chris Hancox All Star Experience. There will also be bands in the White Lion. Apart from music, there will be magic by the magnificent Alexander Wells, who will also be MC’ing, dance by the Hebden Bridge’s famous Hill Millies and a young Colden Morris group, clowns and a local bawdy drama, “Much Ado about Something” by Geoff Scott, about the exploits of some beer-loving and women chasing local lads. There will be both storytelling and song by Ursula Holden Gill. Performances will finish at 7pm, in readiness for the candle-lit evening concert with David Owen Lewis, Margaret Bruce and Iyad Sughayer. There will we a wide feast of beer, wine, tea and food stalls and tents, and craft stalls of all types, on the square, in the churchyard and on Towngate. The two local breweries, Bridestones and Little Valley, will each have a tent, Bridestones on the Square and Little Valley in the old church ruins. The two village pubs, the White Lion and the Cross, and Towngate Tearoom will also be open all day, providing solid and liquid refreshment. Towngate Tearooms, the village deli, will have a stall on the Square and the Proved Pizza Van will also be there. In the ruins will be both Thai and French food stalls and a tea stall run by the church. Come Dine with Me star, Heptonstall’s Jan Lymer, will also have a sweetie stall. On the Square, there will be a vintage clothes tent, Richard Hemmingway’s Ironworks, BEAT (Blackshaw Environmental Action), HELP (Heptonstall Lights and Planting) and Nicola’s knitting stall. In the old church ruins and the churchyard there will be facepainting, hula hooping, sand art and Andy Bell’s Strange Thing. While on Towngate, there will be Blackbark Greenwood Working, Caroline’s church stall, Craggs Cakes and Helen Hought. Something for everyone, Heptonstall’s flowering of cultural and social dynamic will a traffic-free day – a day of relief from eight months when the village was a traffic maelstrom while a landslip closed the by-pass. Christine – hi there! Beverley Smith here. We were friends when you lived in Heptonstall, both times. We tried keeping in touch by letter but it kind of died. We were only 9 or 10 years old. I’m on facebook, otherwise my email address is: dylana4u@hotmail.com. Hope you see this or someone on this site forwards my info to you.